Today I have a very simple layout to show you - beautiful family photos surrounded by some pretty paper and embellishments. The patterned paper is from Studio Calico. 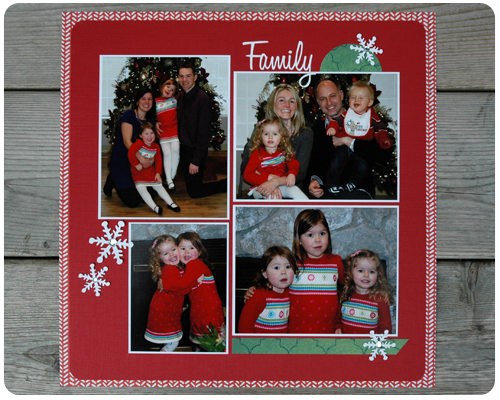 With four large photos on the page, I kept my embellishments to a minimum - these are great family pictures and I really wanted them to take center stage. The snowflakes and title are from Silhouette (purchased and cut). Remember, not every scrapbook page needs to be loaded up with embellishments - sometimes, less is best. Adorable page. Love the matching outfits the girls have on! Thanks Leslie. I love matching outfits on my girls...they look so cute and it makes finding paper for scrapbooking so easy.